So, the very strange “someone forgot to boost” Minute Maid ads aren’t just print ads, they’re also commercials! Um… ok… so that was kind of uncomfortable, actually. See, that doesn’t make me laugh. That makes me go “wow, what a jerk.” And no matter how miraculous that smart-making powers of your juice might be, I don’t see it making him any less of a jerk. The main point is, this certainly doesn’t make me want to buy your juice. I makes me want to stay as far away from the people who made this ad as possible. Especially when taken with the first ad for this campaign that I talked about which showed a guy hurting himself and two people looking at him like he was an idiot and, notably, not helping him. Sorry, but no. Vintage Friday: A Robot Dog from the 1960s! This is a commercial for Gaylord the robot dog, a toy from Ideal in the 1960s. It’s rather different from the robot dog toys we have today, isn’t it? The song is kind of cute, but the dog is less than impressive. Now, I totally believe that a toy that walked by itself like this was cool in the 1960s, but how do taking a step backwards and picking up something that’s placed directly in it’s path count as tricks? And even the song admits that he “walks kind of lazy”. I just have to wonder how long it took for this toy to get boring. I mean, how long can you walk really slowly beside a robot dog or watch a robot dog walk really slowly before you have the urge to do something else? I think I’m with that cat – off to find something else to do! I’ve already looked at how Droid claims history proves robots prevent man from getting lost, but that’s only one of their very strange ads. This is another from the same campaign and made me laugh almost as much. 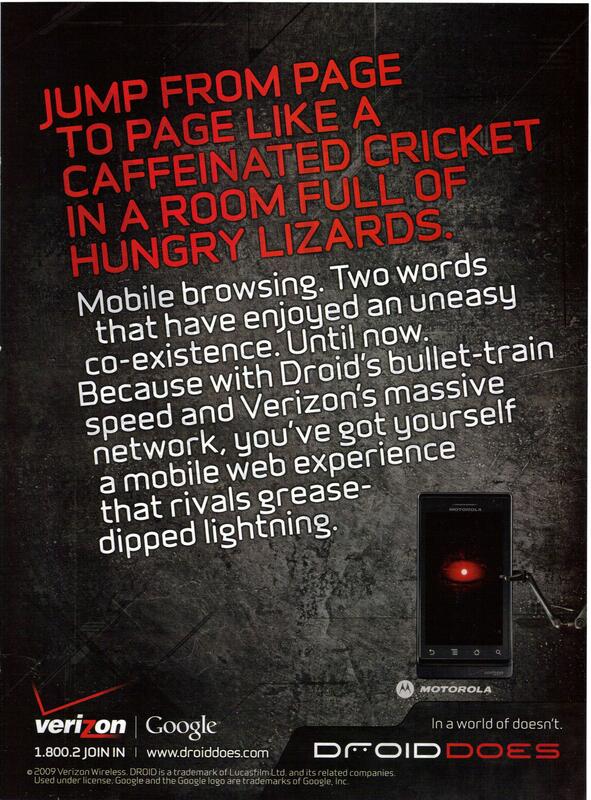 I have to admit, “a caffeinated cricket in a room full of hungry lizards” is a really funny image. Where did they ever come up with it? And would a caffeinated cricket necessarily jump faster than a non-caffeinated one in a dangerous situation? Does caffeine even affect crickets? Not that any of that matters. The point is, I spent a lot more time thinking about the amusing image than about what the ad wanted me to think about – Droid phones and their (apparently) fast browsing speeds. To be honest, I only remembered what this ad was for because I’d already written about Droid phones on this blog and the other ad looked exactly the same as this one. If I hadn’t already had the robot ad in my head, I doubt that I would have managed to remember “Droid” with this ad, although I definitely would have remembered it. So the image got my attention, but it failed to create any correlation in my head with the product, which is sort of a problem since that’s the whole point of the ad. What do you think? Do you think it works or not? Mary-Kay is like Avon, it’s make-up you don’t buy in a store, but rather from your local “representative”. Basically, usually you have to know someone who sells it to get it (although I think they have an online database to help you find local reps now). And yet, they have commercials. Besides the fact that I find it odd that there are commercials for a product line that you can’t just go buy, this is an odd ad in and of itself. 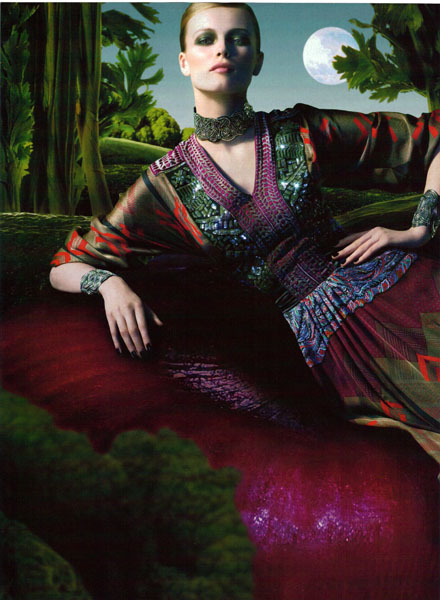 Unlike most beauty ads, it’s totally unfocused. It shows skin care products and make-up in the same ad and it never mentions any actual product names. 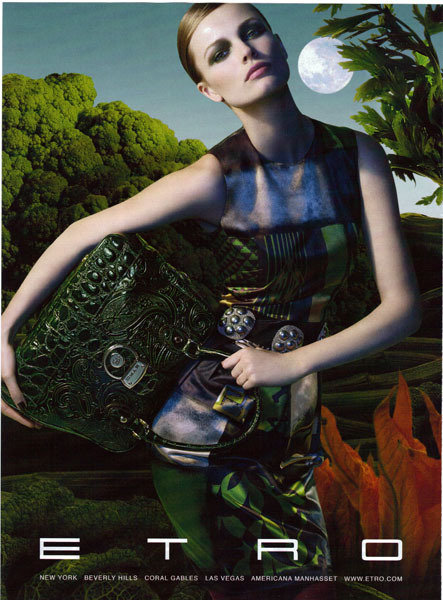 Since part of the point of the sales model is that each rep can sell things her own way – sort of create her own sales pitch – I guess that makes sense. It just makes for an ad that tells us nothing about why we should care about the products and little about why we should care about the brand. 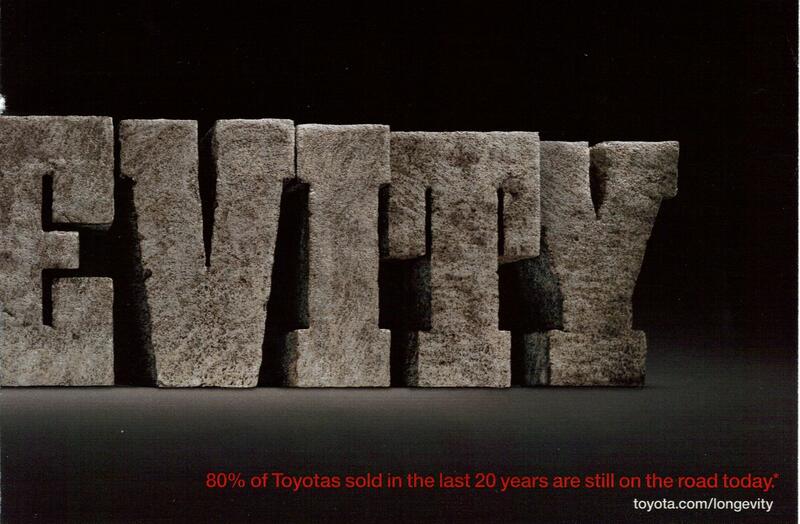 Branding, which I talked about yesterday with Toyota, can be a really good thing. 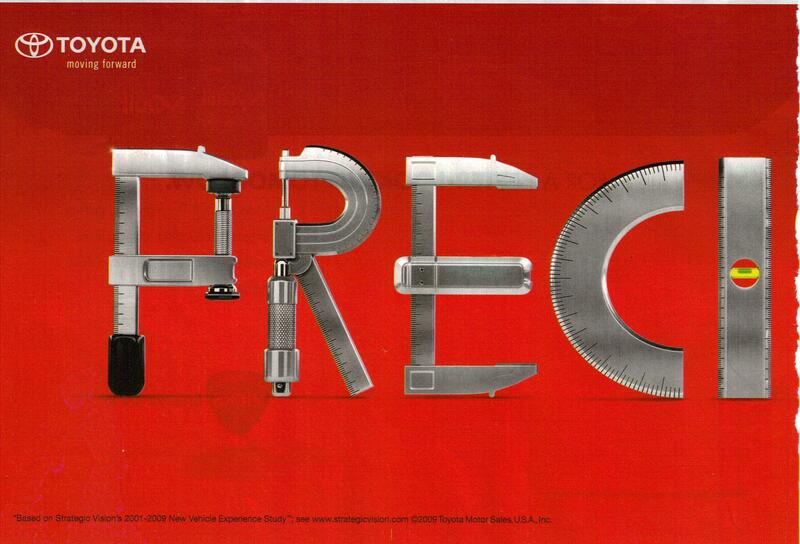 But this ad seems to be trying to do branding and sort of failing, in my opinion. It’s chaotic and while the voice over talks about the ability to have beauty “your way” and implies that they allow for a flexibility other lines don’t, that isn’t evident at all. The models all look sort of the same (which is typical for beauty ads) and even the voice over talks about trends and “modern beauty”. So all we see is that this brand is exactly like everybody else. And the feel is more “trendy” than “flexible”, so the impression I walked away with was that this was just another brand of make-up like everything else available at the drug store. And that’s very bad branding. The point is to stand out, not make yourself fade in even more! 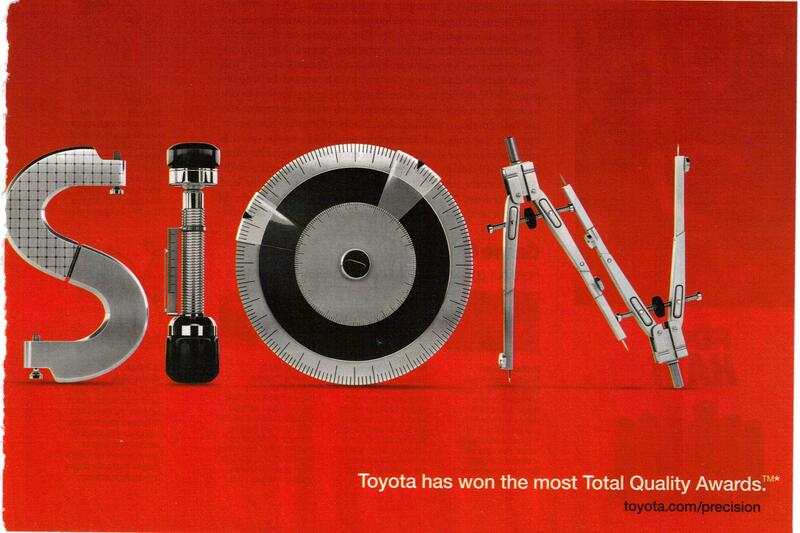 I’ve been finding a series of ads for Toyota lately that are clearly all part of a campaign designed to convince consumers that Toyota embodies the qualities we want in cars. Here are two of them, but I’m pretty sure I saw at least one more somewhere, so if anyone has them, send them to me and I’ll add them to this post. 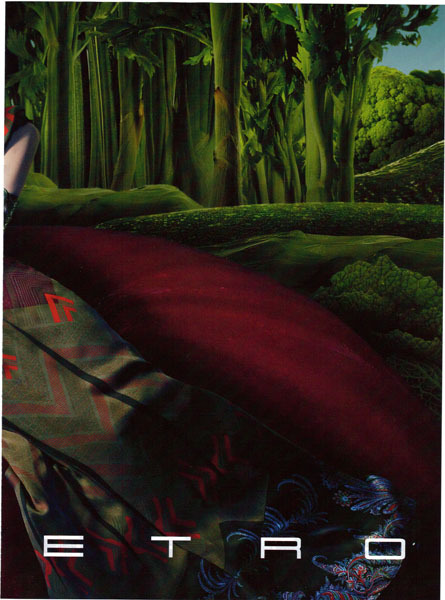 I think that these images are interesting and do a pretty good job of visually conveying the ideas they are trying to represent. I think that the “precision” one is more clever, but both are equally effective. I don’t see a lot of companies doing campaigns like this and I have to wonder why not. They really want to build trust in the brand, not just the specific products. Given how fast new products come out these days, people do rely a lot on their impressions of the brand name. You hear “Oh, I don’t buy products from X, I’ve heard they aren’t as good” or “Well, I don’t know about this new one, but Y always makes good solid products – and they’re made in America, too.” These are impressions of the brand, not the product, so it makes sense for companies to try to build their brand reputation as well as try to sell their specific products. 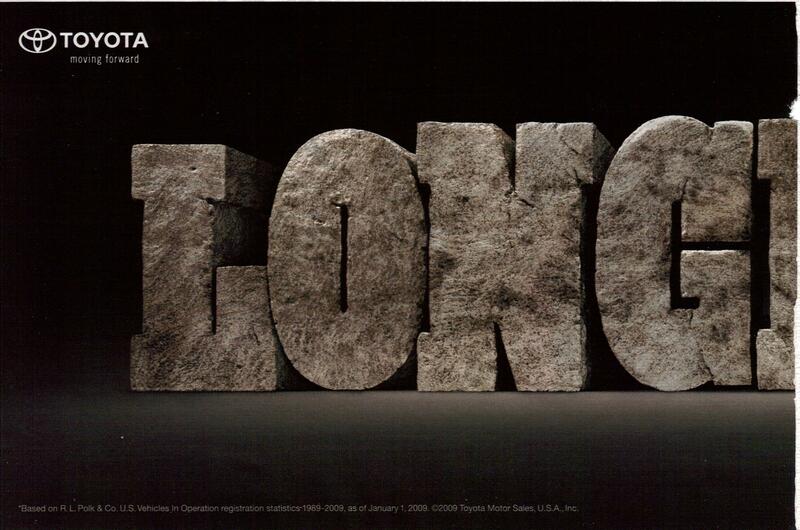 That’s really a long way of saying I think this is a great campaign and wish more companies did creative, clever and less focused ads like this. What do you think? So this movie, Swing Vote, came out about a year and a half ago, but the trailer was interesting, so I decided to feature it. Obviously, this was a very timely movie in 2008, when it came out. I haven’t seen it. But I did find the trailer really interesting. It focuses more on the characters than on the plot itself, which works really well, since it gets viewers engaged without giving away too much of the movie. So what does it show us about the characters? Well, clearly we have an “everyman” American who is going to be singlehandedly choosing the next president, his kind of geeky daughter, and a couple of questionably moral presidential candidates. Since most of us aren’t running for president and the advertisers probably don’t care about kids or what they think, they likely want us to focus on the “everyman” character. What if this guy was choosing our president for us? Well, they seem to have deliberately chosen scenes where he’s as brash and crass as possible, probably to distance him from the polished politicians. We see him doing “manly” things and there are almost no female characters except for the daughter in sight. I’m fairly certain that the election system in the U.S. wouldn’t allow this to happen. The electoral college system just doesn’t work so that the entire country could really come down to one vote. Does every vote count? Yes. Could one vote really tip the balance for the whole country, though? Not really. But the ad shows an interesting view of what Hollywood thinks of “real” Americans, doesn’t it? It also says some interesting things about what Hollywood thinks (or maybe what they think that most people think) of the well-to-do and well educated men who run for president. 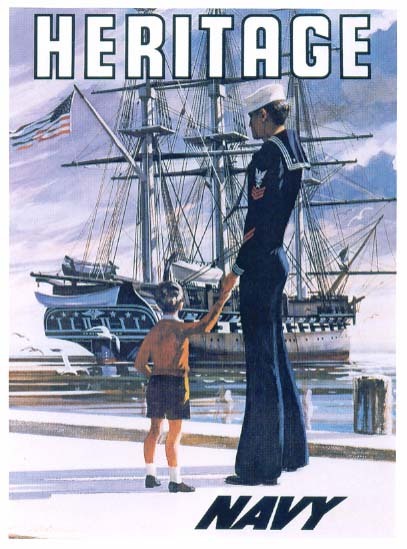 A few days ago I looked at some vintage Navy recruitment posters. Well the armed forces certainly haven’t stopped recruiting and still need ads. Each branch has it’s own ad campaign, of course, and each is different. Some are more interesting than others. 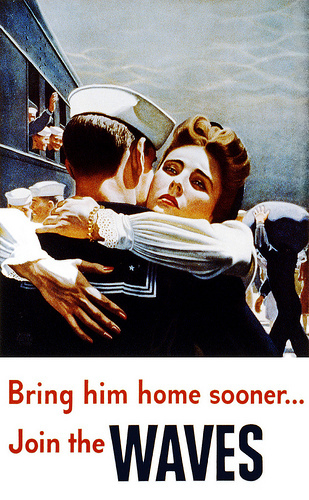 This ad for the Air Force Reserve particularly caught my attention. Your hobby isn’t the only place to find thrills. A part-time career commitment to the Air Force Reserve rewards you with competitive pay, educational benefit packages, affordable health insurance and the opportunity to serve where you live. Certain jobs offer signing bonuses up to $20,000 and training is available for a multitude of vocations, whether you have prior military service experience or not. For an adrenaline rush of epic proportions, live the extreme. I find it really interesting that this ad shows a guy all by himself playing a sport that is, by it’s very nature, solitary. Military training isn’t exactly solitary and it’s certainly not self guided, like snowboarding tends to be. 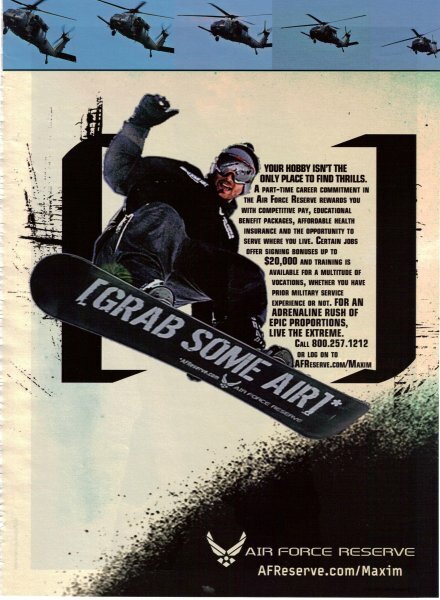 But the goal here is clearly to try and suggest that you could get the same rush from the Air Force Reserve as you can from playing extreme sports. That’s also an interesting choice, since one of the listed benefits is staying where you are. 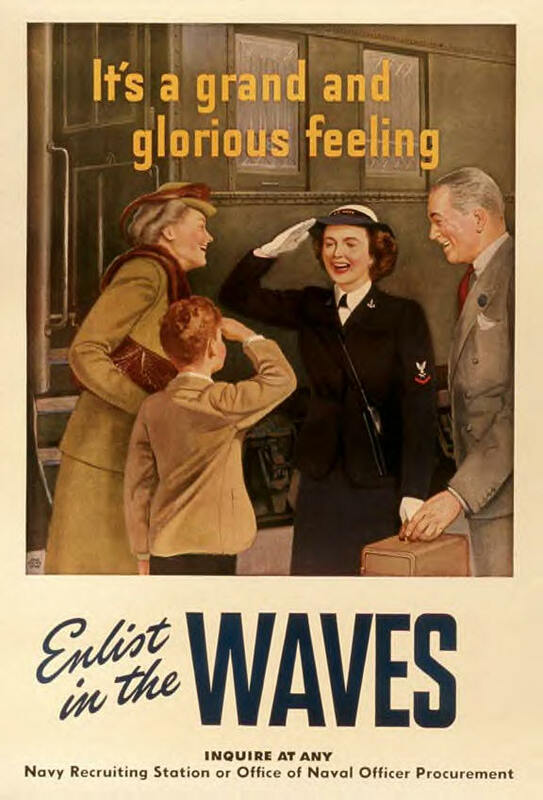 Usually when we think of the extreme action available from the military, we think of travel and combat and neither is even mentioned as a possibility by this ad. In fact, it sounds like you’d never have to see combat in the Air Force Reserve. So how are they extreme, again? 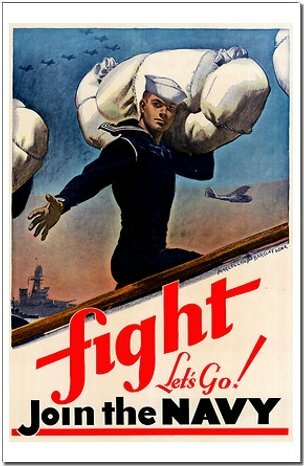 Vintage Friday: Join the Navy! 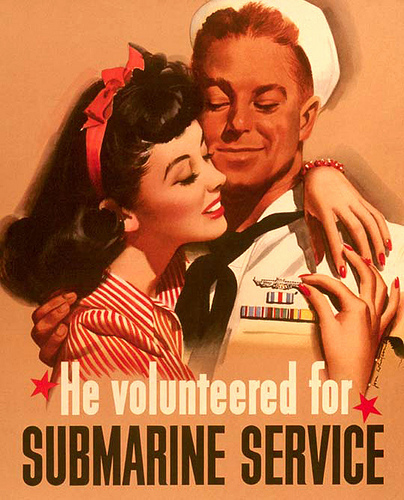 Some of the most interesting pieces of advertising are propaganda and recruitment posters. I’ve collected a lot of these and they will show up on this blog from time to time. 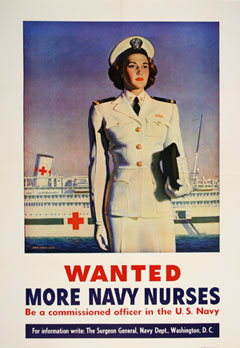 Today I’ve got a collection of different posters for the Navy. 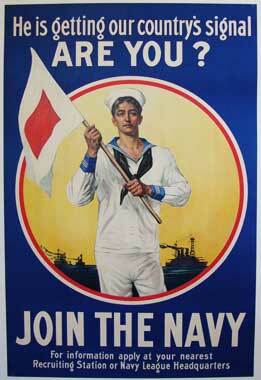 Most are from around World War II and all give different reasons for joining the Navy. And if none of those reasons work for you, maybe you just need to prove that you aren’t missing something! So which reason would you pick? Personally, I think that the posters show an interesting variety. 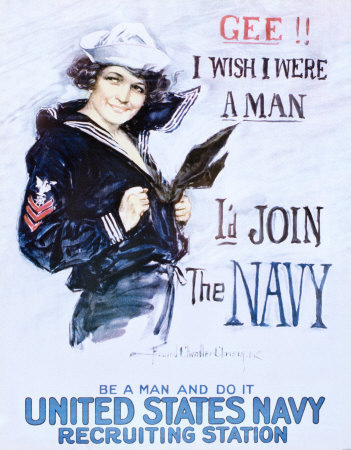 It’s clear that the Navy was spreading it’s net as wide as it could and trying to appeal to as many different kinds of people as possible. 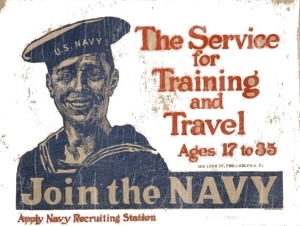 And, of course, this is only a tiny fraction of the Navy recruitment posters produced at the time. I wonder who’s job it was to make them? Some of them are certainly very beautiful. The “Heritage” one with the ship is especially pretty. Do you have a favorite? Which one is it and why?